Painting Citadel miniatures lies at the heart of the Games Workshop hobby, an essential element of making the most of your miniatures collection. If your miniatures are predominantly one colour (such as Space Marines and Stormcast Eternals), use a Citadel Spray. It’s much quicker than basecoating by hand, leaving you more time to slay your enemies. 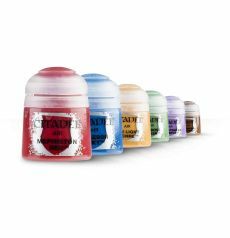 Our range of tools have been specifically designed to be used with Citadel miniatures. These precision tools have been custom made from the finest materials to ensure the best quality when assembling your models. This is your free guide to the Citadel Paint System - a straightforward and simple method for painting Warhammer miniatures that breaks down the process into a series of easy steps. If you want to get painting straight away we have a variety of paint sets available to purchase. We'd recommend any of the three above to a brand new painter as they provide everything you need to get started.